If you've ever worked in a biochemistry laboratory, you've probably used BSA. Bovine serum albumin is a small, stable, relatively non-reactive protein, so it is useful for all sorts of things, such as stabilizing proteins in biochemical assays, nourishing cells in culture, and acting as a standard for measuring protein concentrations. Another advantage is its ready availability. Roughly half the protein in cow blood serum is BSA, so large quantities are available from the cattle industry. BSA and other mammalian serum albumins are specialists in binding molecules that are insoluble in water. They soak up fatty acids and hydrophobic hormones such as thyroxine and shuttle them through the blood, releasing them for use by cells throughout the body. They also bind to many drugs and affect their delivery through the blood, which is important when determining the proper dosage. And on top of all that, serum albumins also play a role in the handling of metal ions such as calcium, magnesium, zinc and copper. Until recently, however, the atomic details of BSA have been largely unknown. 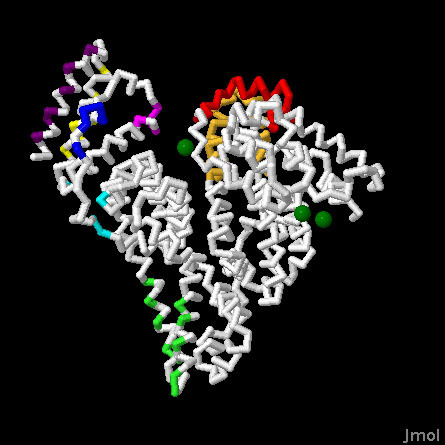 PSI researchers at NYSGRC (the Minor group at University of Virginia in collaboration with the Chruszcz group at University of South Carolina) have solved the structure of BSA, shown here from PDB entry 3v03, along with the related serum albumins from horses and rabbits. All have the characteristic heart-shaped structure previously observed for human serum albumin, composed of three flexible domains. The binding sites are tucked inside the three domains. Many structures of human serum albumin have been solved to reveal the binding sites for hydrophobic molecules. There are seven separate sites for binding of fatty acids, as seen in PDB entry 1e7i. The thyroid hormone thyroxine also binds in several places, as seen in PDB entry 1hk1. Drugs, however, often bind at a single location, as seen in the structure of diazepam (Valium) from PDB entry 2bxf. The BSA structure is the first glimpse at the ion binding sites: three calcium ions bind to specific locations on the surface. BSA is very similar to our own serum albumin, but in some people, the differences are enough to cause problems with allergies. This is unusual, because closely related proteins like serum albumin rarely cause an allergic response. 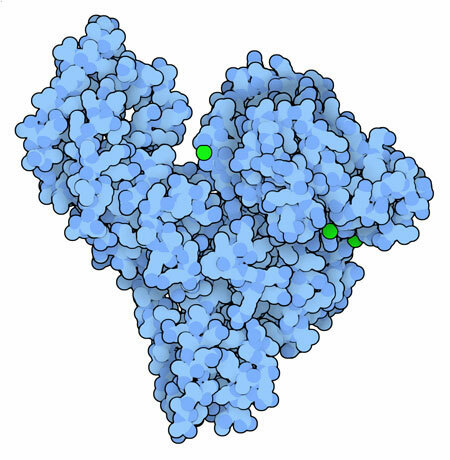 The PSI structure has allowed researchers to refine the epitopes on the protein that are recognized by antibodies in the allergenic reaction, shown here in color on the BSA structure. To explore this structure in more detail, the JSmol tab below displays an interactive JSmol. PSI researchers have refined the epitopes on BSA, narrowing down the observed sites that show allergenic activity to sites that are accessible to antibodies in the folded protein. Use the buttons to highlight the predicted sites from the PSI study and to display human serum albumin, which has a very similar structure. Varshney, A., et al. Ligand binding strategies of human serum albumin: how can the cargo be utilized? Chirality 22, 77-87 (2010). Chruszcz, M., et al. Serum albumins--unusual allergens. Biochim. Biophys. Acta, in press (2013). Ghuman, J., et al. 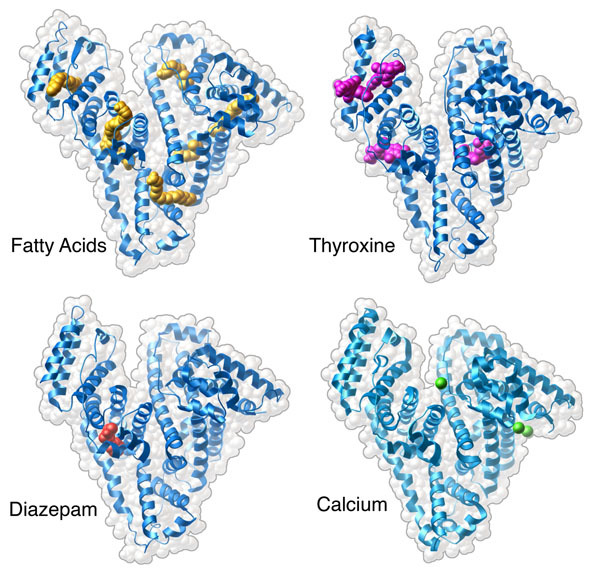 Structural basis of the drug-binding specificity or human serum albumin. J. Mol. Biol. 353, 38-52 (2005). Majorek, K. A., et al. Structural and immunologic characterization of bovine, horse, and rabbit serum albumins. Mol. Immunol. 52, 174-182 (2012).